the superstructure is characterised by the various wall surfaces extending obliquely in a forward or backward tilt. 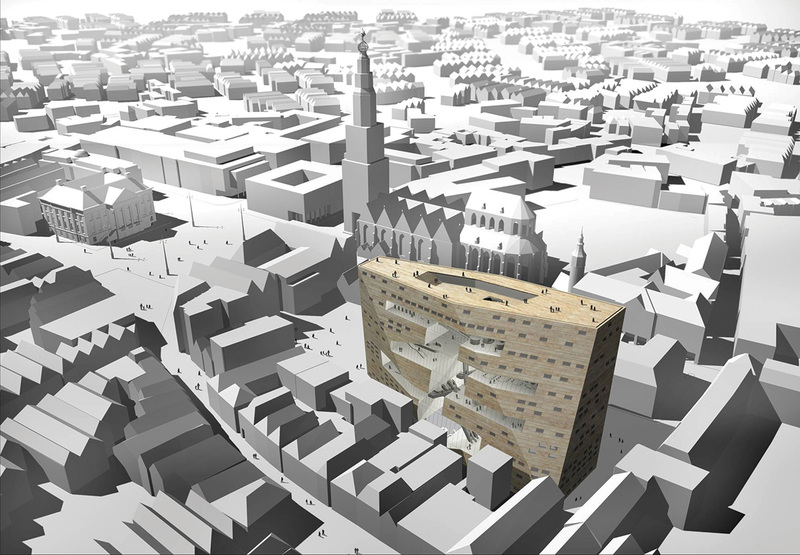 From this contour a ‘keyhole to the city’ that forms the atrium is achieved. facilitate exhibitions and presentations. In addition, the Forum houses two open stages, workstations for students and self-employed people, a grand café, a movie café, a restaurant on the top floor, a roof cinema and a library. The substructure houses a 5-storey parking garage and a single-storey bicycle parking facility. ABT is involved in feasibility studies of the plan, structural design, architectural plan development, construction management, project management and supervision, geotechnical consultancy, BIM coordination, design management and construction logistics plans. Unique for the steel trusses is that the top line of the trusses can slide at the top line until the building is complete. This prevents additional forces, partially caused by translating of the concrete core, negatively influence the steel structure. The parking garage consists of concrete floors, walls and columns. The outer walls of the bicycle parking facility consist of traditional concrete walls. The deep basement diaphragm wall panels have the thickness of 1.0 to 1.2 m.
The floors of the garage give, in addition to the vertical traffic loads, horizontal support to the outer walls because of the elongated void in the middle. In order to optimise the construction process, an underwater concrete floor (thickness: 1.0 m) is made. All floors are made of steel fibre reinforced concrete. From an engineering point of view, the Groninger Forum is a very complex structure. During the development ABT uses SCIA Engineer for all engineering challenges. 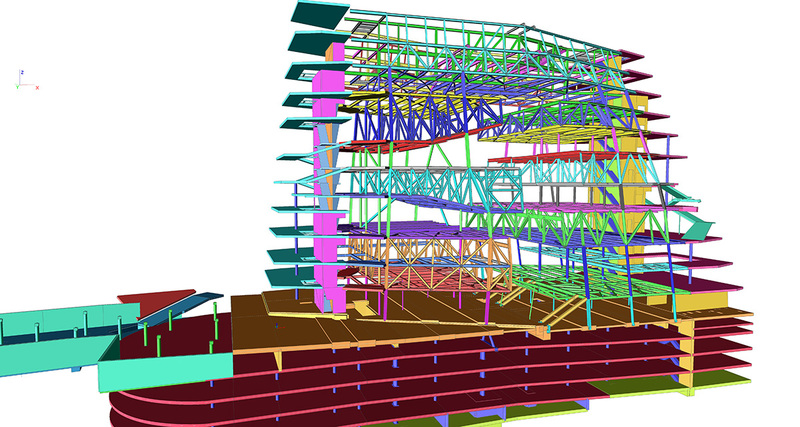 In the preliminary stages, for 2D analysis of trusses and floors. 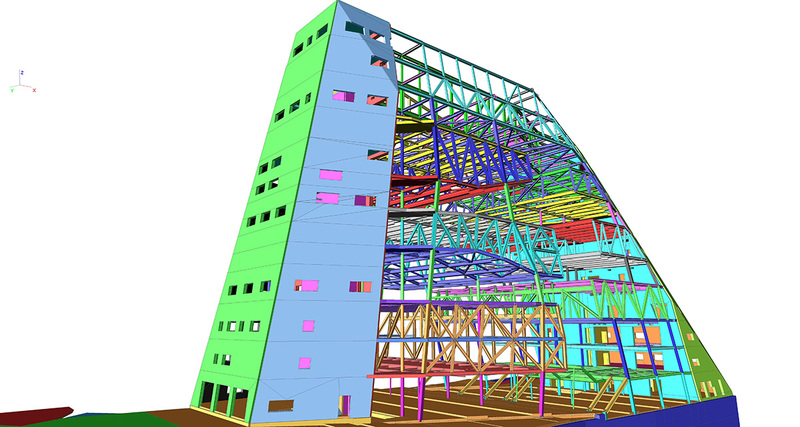 Later on, in the process for 3D analysis, detailed analysis of 2nd order, stability and stiffness, of sub-sections of the building. Finally, the sub-models are merged into one overall model. This working method has resulted in an essential and exact understanding of the behaviour of the building and also given direction to the assembly plan. 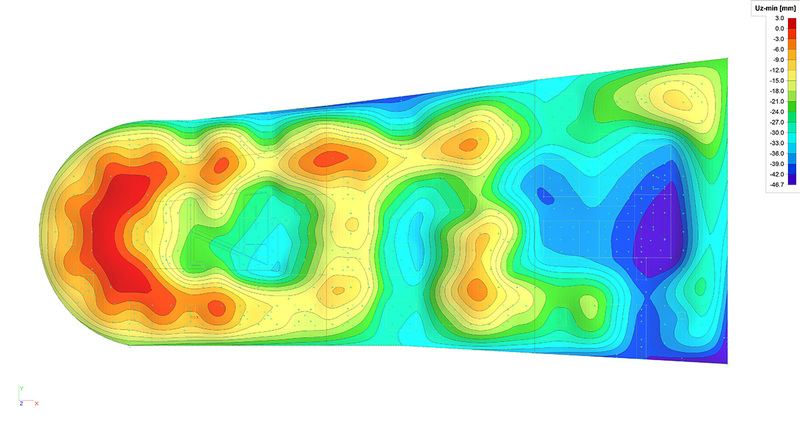 The complexity of the building shape also has an effect on building the FEM models. Connecting the sloping floors and oblique facades demands a very precise model to ensure accurate results. Also, the aligning and connecting elements in transition areas required the necessary care. Due to the interface of SCIA Engineer, quick and steady editing of the geometry can easily be done.